Tour leaders Patti Steinour, left, and Karen Fiorile at Hamilton Crossing in Whitehall. Central Ohio community activists Karen Fiorile and Patti Steinour keynoted a special Strengthening Communities Bus Tour on Jan. 23, encouraging participants to get behind Homeport in addressing the needs of affordable housing in Central Ohio. Fiorile, a former Homeport Board member, and Steinour were joined on the Homeport tour by 14 other civic and business leaders along with two current Homeport Board members and nine members of the Homeport staff. Homeport Vice President of Real Estate Development Leah Evans, left, standing, guides Strengthening Communities Bus Tour members on the history of American Addition and the role Homeport is playing in its revitalization. The trip included a visit to American Addition where Homeport is building and selling single-family homes in the historic African-American community on the Northeast Side of Columbus. The tour also went to the 180-unit Marsh Run apartment community near Eastland, where participants heard about how the expansion of a community center has allowed for study, after school and summer programming for children. The tour concluded with a lunch at Homeport’s newest senior community, Hamilton Crossing, in Whitehall. Steinour and Fiorile talked there about previous efforts they have been involved within the community and the impact others could make on Central Ohio residents if they were to get involved with Homeport. To sign up for the next bus tour on March 20 click here. To learn more about it or other opportunities to support Homeport, contact Laverne Price, Senior Director of Resource Development, at 614 545-4891 or laverne.price@homeportohio.org. The Strengthening Communities Bus Tour is sponsored by State Auto Insurance Companies. 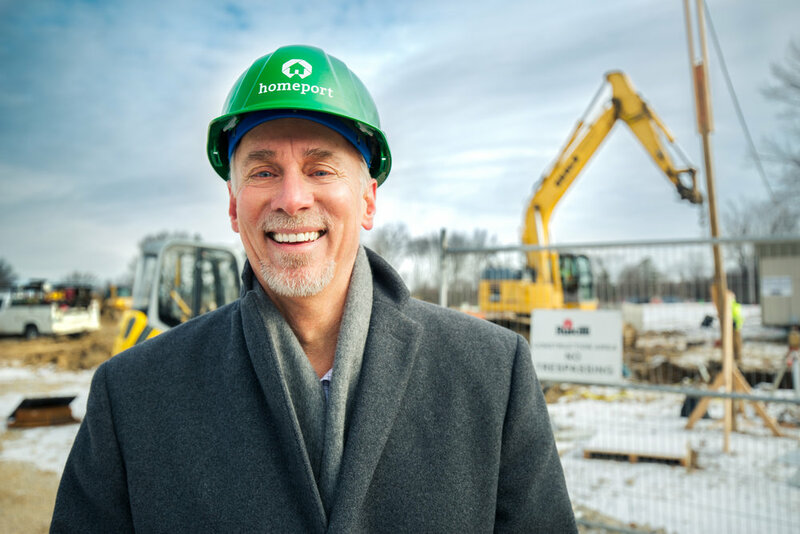 Mark McCullough, AEP Executive Vice President, Transmission, at construction site of Homeport’s Blacklick Crossing development in Reynoldsburg. Photos by Caitlin Sadler/AEP. American Electric Power (AEP) in February will highlight its Executive Vice President of Transmission, Mark McCullough, for his long-term commitment to the community, particularly as a Homeport Board of Directors member. McCullough has been on Homeport's Board since 2011. Click here to read the rest of that story. Homeport’s Bruce Luecke, Netta Whitman and Laverne Price accept U.S. Bank gift from Stephen Bennett, right. Homeport rang in the new year with a beautiful gift from U.S. Bank. U.S.Bank Central Ohio Regional President Stephen Bennett personally delivered a check of $11,800 to Homeport’s offices the first week of 2019. The funds will go for homebuyer education, financial fitness and other counseling from Homeport’s Housing Advisory Services team. Audience participation was strong for OSU Chemistry Demonstration Lab Supervisor Angela Miller. After school students at Homeport's Emerald Glen community got the scoop on Jan. 14 on how to make ice cream — and who can make it — thanks to a special presentation from an Ohio State University chemistry lab supervisor. "The purpose of the event was to complement some of the activities that we do at the site. We aim to help our kids to be whole rounded individuals as well as prepare them for the future," said Ethiopian Tewahedo Social Services (ETSS) Site Coordinator Jason Maageria. “This particular event was a simplified introduction to the world of Chemistry and Science in general. My personal goal for the event was to have someone introduce science in fun way and to demystify the old cliché that ‘science is boring’ and ‘only boys are good at science,’” Maageria said. The class was led by OSU Chemistry Lab Supervisor Angela Miller with help from one of her students, Judith Ramos, as part of an outreach activity sponsored by the OSU Department of Chemistry and Biochemistry.